It is widely recognized that the phenotype of familial hyperkalemic hypertension is mainly a consequence of increased activity of the renal Na+–Cl− cotransporter (NCC) because of altered regulation by with no–lysine–kinase 1 (WNK1) or WNK4. The effect of WNK4 on NCC, however, has been controversial because both inhibition and activation have been reported. It has been recently shown that the long isoform of WNK1 (L-WNK1) is a chloride-sensitive kinase activated by a low Cl- concentration. Therefore, we hypothesized that WNK4 effects on NCC could be modulated by intracellular chloride concentration ([Cl-]i), and we tested this hypothesis in oocytes injected with NCC cRNA with or without WNK4 cRNA. At baseline in oocytes, [Cl-]i was near 50 mM, autophosphorylation of WNK4 was undetectable, and NCC activity was either decreased or unaffected by WNK4. A reduction of [Cl-]i, either by low chloride hypotonic stress or coinjection of oocytes with the solute carrier family 26 (anion exchanger)-member 9 (SLC26A9) cRNA, promoted WNK4 autophosphorylation and increased NCC-dependent Na+ transport in a WNK4-dependent manner. Substitution of the leucine with phenylalanine at residue 322 of WNK4, homologous to the chloride-binding pocket in L-WNK1, converted WNK4 into a constitutively autophosphorylated kinase that activated NCC, even without chloride depletion. Elimination of the catalytic activity (D321A or D321K-K186D) or the autophosphorylation site (S335A) in mutant WNK4-L322F abrogated the positive effect on NCC. These observations suggest that WNK4 can exert differential effects on NCC, depending on the intracellular chloride concentration. Essential hypertension is a major risk factor for mortality worldwide. Salt reabsorption by the kidney plays a central role in its development. All monogenic diseases featuring high or low blood pressure are caused by mutations in genes encoding the renal salt transporters or their regulatory pathways.1 Among those are disorders affecting the activity of the renal Na+:Cl- cotransporter (NCC). Inactivating mutations of NCC result in Gitelman’s syndrome (OMIM 263800) featuring arterial hypotension. In contrast, NCC activation triggers familiar hyperkalemic hypertension (OMIM 145260). This syndrome is caused in some patients by mutations in with no lysine (K) kinase 4 (WNK4). The understanding of NCC regulation by WNK4 has been complicated by contradictory findings. Many groups have reported that WNK4 reduces activity, phosphorylation, and half-life of NCC in vitro and in vivo.2–7 However, evidence for WNK4-induced NCC activation has also been documented.8,9 In this regard, the WNK4 inhibitory effect could be reversed by angiotensin II,10 suggesting that WNK4 inhibitory and activating effects may coexist and be modulated by the renin-angiotensin system.8,10 A reduction of [Cl-]i is associated with increased activity and phosphorylation of NCC11 by Ste20-related proline-alanine rich kinase (SPAK),12 which in turn is modulated by WNKs.13 It has been suggested that WNKs behave as chloride-sensitive kinases.14 Therefore, we hypothesized that [Cl-]i could modulate the effect of WNK4 toward NCC, potentially explaining the dual effect of the kinase. 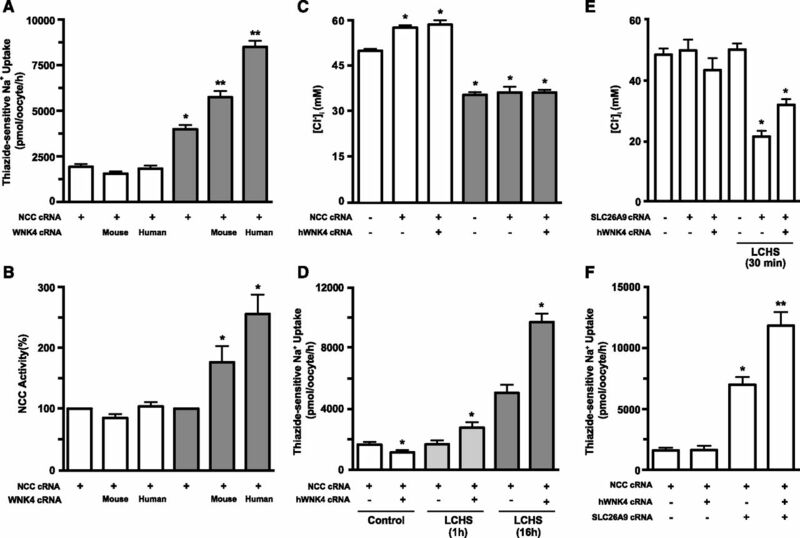 To test this hypothesis, the functional activity of NCC was assessed in oocytes exposed to control conditions or low chloride hypotonic stress (LCHS) that is known to increase NCC phosphorylation and activity.11,12 Coinjection of NCC and mouse WNK4 cRNA resulted in a slight but significant decrease in NCC-mediated Na+ uptake. LCHS induced a significant increase in NCC activity, which was further enhanced by coexpression with either mouse or human WNK4 (Figure 1, A and B). WNK4 effect on NCC is modulated by [Cl-]i. (A) Functional expression assay shows the thiazide-sensitive Na+ uptake in groups of oocytes injected with NCC cRNA alone or together with mouse WNK4 or human WNK4 cRNA, as stated. Uptake was performed in control conditions (white bars) or after 16 hours of LCHS (gray bars) (see Supplemental Material). *P<0.01 versus same group in control conditions. **P<0.05 versus NCC in LCHS. n=13. (B) Uptake in oocytes injected with NCC alone, in control conditions (white bars) or LCHS (gray bars), was arbitrarily set to 100%, and the corresponding groups were normalized accordingly. *P<0.01 versus any group in control conditions and versus NCC in LCHS. (C) The [Cl-]i in oocytes was assessed with custom-made glass capillary ion selective microelectrodes 48 hours after injection of water, NCC, or NCC plus WNK4 cRNA, as stated, in control conditions (white bars) or after 16 hours of LCHS (gray bars). *P<0.05 versus water injected in control conditions. n=2 (six oocytes per group, per experiment). (D) Uptake was performed in control conditions (white bars) or in LCHS in 1 hour (light gray bars) and 16 hours (dark gray bars) in groups injected with NCC alone or NCC plus WNK4 group, as stated. *P<0.05 versus own control. n=3. (E) [Cl-]i in oocytes injected with water, SLC26A9, or SLC26A9 plus WNK4 cRNA, as stated, after 48 hours of incubation in ND96 or after 30 minutes of LCHS. *P<0.05 versus water in control conditions. n=3. (F) Thiazide-sensitive Na+ uptake in oocytes injected with NCC cRNA alone and NCC plus WNK4 cRNA in the absence or presence of SLC26A9 cRNA. *P<0.01 versus NCC or NCC plus WNK4 groups. **P<0.05 versus NCC plus SLC26A9 cRNA injection. We next assessed how time of exposure to LCHS altered the regulation of NCC by WNK4 because previous observations have shown that [Cl-]i slowly decreases under these conditions.16 One hour of LCHS had no effect on Na+ uptake in oocytes injected with NCC alone, whereas 16 hours resulted in a significant increase (Figure 1D). In contrast, WNK4 expression led to a significant activation of NCC after only 1 hour and was further increased after 16 hours. Therefore, the presence of WNK4 accelerated the effect of LCHS on NCC. Because LCHS may have several effects on oocytes, we used an alternative method to reduce [Cl-]i by coinjecting SLC26A9 cRNA, which in the absence of extracellular Cl- performs as a chloride efflux pathway.17 Indeed, 2 days after injection, the [Cl-]i was similar in water, SLC26A9, or SLC26A9 plus WNK4 injected oocytes, whereas LCHS for only 30 minutes significantly reduced the [Cl-]i in SLC26A9 or SLC26A9 plus WNK4, but not in water oocytes (Figure 1E). As a consequence, NCC activity was increased, and this effect was dramatically potentiated by WNK4 (Figure 1F). Activation of NCC under LCHS is associated with increased phosphorylation of key residues in the amino-terminal domain.11,12 To determine if the catalytic activity of WNK4 is required for NCC activation in these conditions, we used the catalytically inactive mutant WNK4-D321A.13 This mutant not only prevented the activation of NCC by WNK4, but it also decreased its activity below the level of oocytes injected with NCC alone in LCHS (Figure 2A). 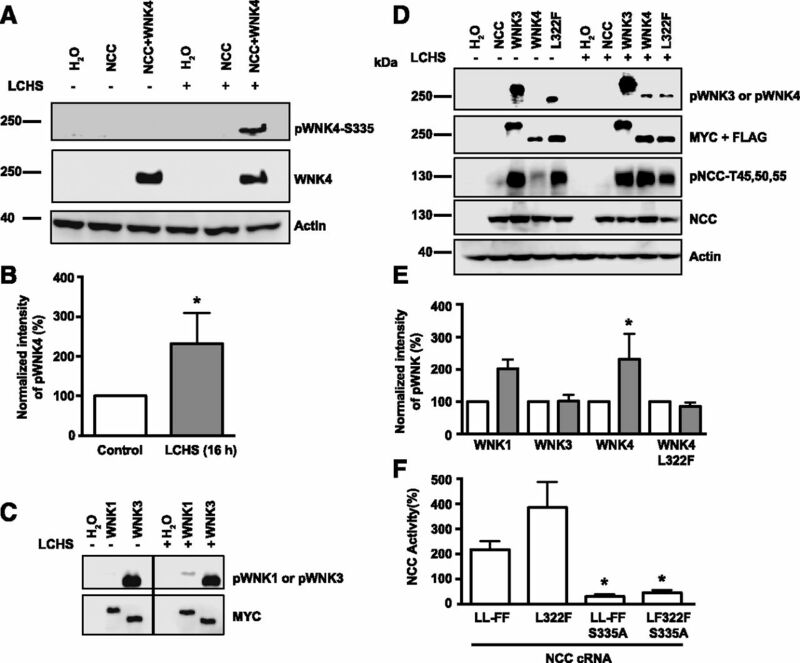 Because our previous experiments suggested basal NCC activity relies on the endogenous long isoform of WNK1 (L-WNK1),18 these results suggest WNK4-D321A may prevent the effect of endogenous L-WNK1 during LCHS. Elimination of the putative Cl--binding pocket turns WNK4 into a constitutive activator of NCC. (A) NCC activity in oocytes injected with NCC cRNA (white bars), NCC plus wild-type WNK4 (black bars), or NCC plus catalytically inactive WNK4-D321A (red bars), as stated. Oocytes were incubated in the control solution or LCHS for 16 hours before the measurement of Na+ uptake. Uptake in oocytes injected with NCC alone and incubated in control or LCHS was arbitrarily set to 100%, and the NCC plus WNK4 or NCC plus WNK4-D321A groups were normalized accordingly. *P<0.05 versus NCC corresponding control. n=3. (B) Uptake in oocytes injected with NCC alone was arbitrarily set to 100% (white bar), and the rest of the groups were normalized accordingly (as stated, WNK4-LL-FF is the blue bar, WNK4-L322F is the green bar, WNK4-L324F is the orange bar, and WNK4-LL-FF-DA and WNK4-LL-FF-DKKD are the red bars). These series of experiments were performed in control conditions only. *P<0.01 versus NCC alone. n=6. (C) Representative Western blot showing the effect of wild-type or mutant WNK4, as stated, on NCC expression and phosphorylation in control conditions. Blot shows WNK4, pNCC, NCC, and actin expression, as stated. WNK4 is present only in oocytes injected with wild-type or mutant WNK4. (D) Densitometric analysis of data compiled from five different experiments. NCC basal phosphorylation (white bar) was arbitrarily set to 100% and the corresponding groups were normalized accordingly (as stated, WNK4 wild-type (black bar), WNK4-LL-FF (blue bar), WNK4-L322F (green bar), WNK4-L324F (orange bar) and catalytically inactive WNK4-LL-FF-DA (red bar). *P<0.05 versus NCC. Piala et al.19 showed that L-WNK1 autophosphorylation and activity is inhibited by [Cl-]i, therefore demonstrating that L-WNK1 is a chloride-sensitive kinase. They identified two leucine residues, conserved among WNKs, in the catalytic domain of L-WNK1 (L369 and L371) that serve as the Cl- binding site. To test whether these residues display the same function in WNK4, we replaced the homologous residues (L322 and L324) by phenylalanine (WNK4-L322F, WNK4-L324F, and the double mutant WNK4-LL-FF). WNK4-LL-FF induced a remarkable activation of NCC in control conditions (Figure 2B). Mutation of L322 alone resulted in a greater increase in NCC activity, similar to what was observed for WNK4 in LCHS. Moreover, the activation of NCC by WNK4-LL-FF is kinase-dependent. The introduction of the D321A or the double-charge D321K-K186D mutations in WNK4-LL-FF not only prevented the activation of NCC, but also abolished most of its activity (Figure 2B). Therefore, elimination of the Cl- binding site turned WNK4 into a constitutive activator of NCC, in a kinase-dependent manner. This was further confirmed by analysis of NCC phosphorylation.12 WNK4-LL-FF and WNK4-L322F stimulated NCC phosphorylation on all three residues tested, whereas WNK4-LL-FF-DA completely prevented it (Figure 2, C and D). To analyze the effect of [Cl-]i on WNK4 activity, we determined the autophosphorylation status of serine residue S335, known to be required for WNK activation. According to Piala et al.,19 phosphorylation of L-WNK1 homologous serine (S382) is modulated by chloride. No phosphorylation of WNK4 was observed in control conditions, whereas it became evident in oocytes challenged with LCHS (Figure 3, A and B). The phosphorylation level of L-WNK1 S382 was also increased by LCHS, whereas it was similar in both conditions for WNK3 S308 (Figure 3C). Interestingly, WNK4-L322F was strong in basal conditions and was not affected by LCHS (Figure 3, D and E). These findings suggest WNK3 and WNK4-L322F are less sensitive to [Cl-]i than L-WNK1 and WNK4. Supporting that phosphorylation of WNK4-S335 is required for NCC activation; mutation of this residue to alanine in WNK4-LL-FF and WNK4-L322F abrogated their effect on NCC (Figure 3F). Modulation of WNK autophosphorylation by decrease of [Cl-]i induced by LCHS. (A) Representative Western blot showing the effect of LCHS on wild-type WNK4 autophosphorylation, as stated, in control conditions or LCHS. Blot shows pWNK4, WNK4, and actin expression, as stated. Phosphoantibody recognizing S335 in WNK4 was developed and characterized by Thastrup et al.30 (B) Densitometric analysis of compiled results from six different experiments. Phosphorylation level of WNK4 in control conditions was arbitrary set to 100% (white bar), and the phosphorylation status in LCHS was normalized accordingly (gray bar). *P<0.05 versus control (Wilcoxon signed-rank test). (C) L-WNK1 and WNK3 autophosphorylation at S382 and S308, respectively, in control and LCHS conditions, as stated. The upper blot depicts phospho-WNK, and the lower blot shows the total amount of L-WNK1 or WNK3 as detected using anti-Myc antibody. Original image was cropped to eliminate empty lanes and show the L-WNK1 and WNK3 lanes only. (D) Representative Western blot of phospho-WNKs (WNK3, WNK4, or mutant WNK4-L322F), total WNKs, phospho-NCC, NCC, and actin in control conditions and after LCHS, as stated. (E) Densitometric analysis of compiled results from six experiments for WNK4: three for WNK3, three for WNK4-L322F, and two for L-WNK1. White bars depict phosphorylation status in control conditions arbitrarily taken as 100%, and gray bars depict the phosphorylation status in LCHS, as normalized for its corresponding white bar. *P<0.05 versus control (Wilcoxon signed-rank test). (F) NCC activity in oocytes injected with mutant WNK4-LL-FF, WNK4-L322F, WNK4-LL-FF-S335A, or WNK4-L322F-S335A, as stated. Uptake in oocytes injected with NCC alone was arbitrarily set to 100%, and the corresponding groups were normalized accordingly. These series of experiments were performed in control conditions only. n=4. *P<0.001 versus corresponding group without S335A substitution. Soon after the recognition that mutations in WNK4 cause familiar hyperkalemic hypertension,20 it was reported that WNK4 reduces the activity of NCC in Xenopus laevis oocytes and mammalian cells.2–6,21 Animal models supported the in vitro observations because overexpression of WNK4 in transgenic mice resulted in decreased expression and phosphorylation of NCC.7 However, one study reported increased NCC activity by human WNK4 in Xenopus oocytes,22 and inactivation of WNK4 in mice resulted in a reduced NCC phosphorylation and expression.8 Moreover, both parameters were increased in a new model of WNK4 overexpression in mice.9 Therefore, there is evidence in vitro and in vivo for both inhibition and activation of NCC by WNK4. Here we present data indicating that WNK4 is a chloride-sensitive kinase, potentially explaining the dual effects of WNK4 on NCC. In the presence of high Cl- concentrations, WNK4 is inactive and may reduce basal activity of NCC by its inhibiting interaction with L-WNK1 and WNK3.18,21 When [Cl-]i is low, WNK4 phosphorylation, and therefore activity, is stimulated, thereby activating the cotransporter (Figure 4). Our results suggest a similar mechanism to the one proposed by Piala et al.19 is probably involved in the switch of WNK4 behavior. A cell scheme of a X. laevis oocyte illustrating the effect of intracellular chloride concentration on wild-type WNK4 and mutant WNK4-L322F effect on NCC. 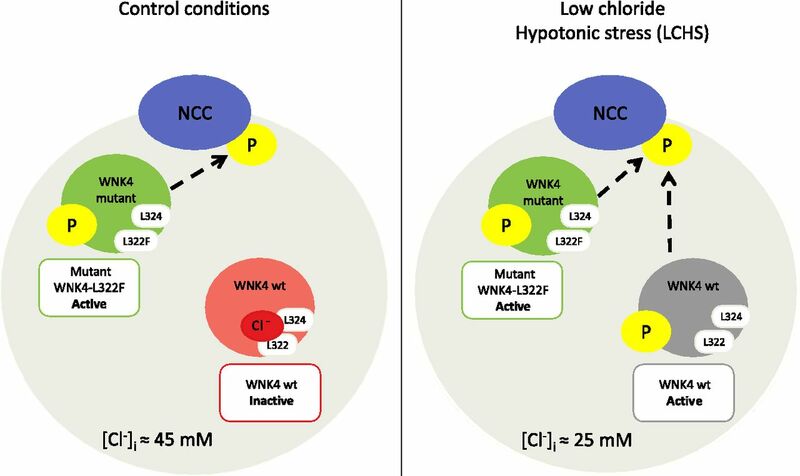 In control conditions, were intracellular chloride concentration fluctuates around 45 mM, wild-type (wt) WNK4 is inactive, resulting in a negative or neutral effect on NCC activity. Disruption of the chloride binding site in mutant WNK4-L322F turns it into a constituitively autophosphorylated actuate kinase that has a positive effect on NCC activity even without chloride depletion. Reduction of intracellular chloride to around 25 mM (after LCHS) is sufficient to promote wt WNK4 autophosphorylation, turning it into an activator of NCC. [Cl-]i of distal convoluted tubule cells ranges from 14 to 20 mM.27–29 Therefore, small changes in [Cl-]i, could have an important effect on NCC regulation by WNK4. Further experiments and mathematical modeling are required to explore this hypothesis and the role of [Cl-]i in the regulation of NCC in physiologic conditions. All mutant WNK4 constructs were generated by site-directed mutagenesis, and their sequence was checked by automatic DNA sequencing. Our institutional committee on animal research approved the use of X. laevis frogs. 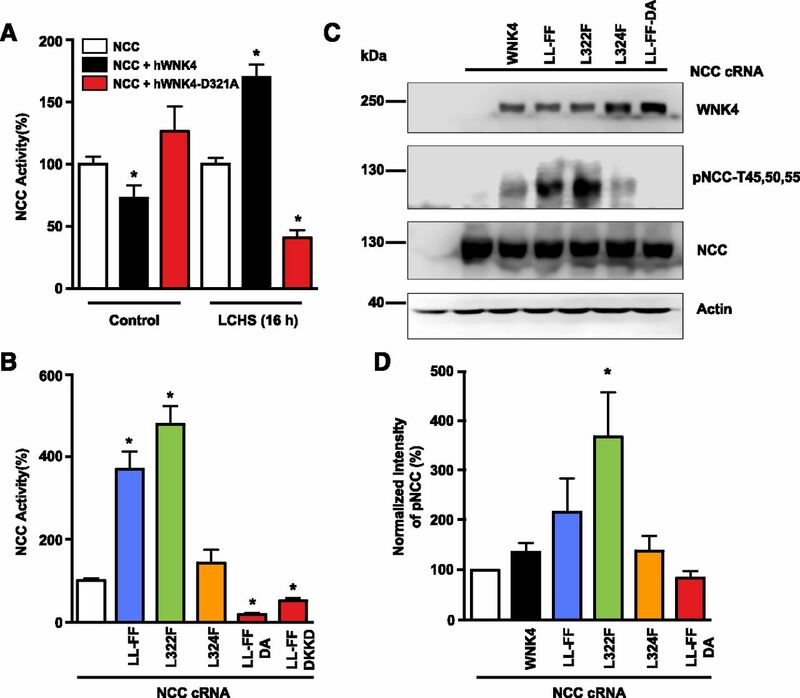 The functional expression of NCC was assessed in X. laevis oocytes microinjected with NCC cRNA alone or together with wild-type WNK4, SLC26A9, or mutant WNK4. Two days later, the thiazide-sensitive 22Na+ uptake was assessed in oocytes exposed to control conditions or to LCHS, following our previously published protocol.11 In brief, the night before the uptake assay, groups of oocytes were incubated in two different osmolar conditions: isotonic (ND96, 210 mosm/kg H2O) or low Cl- hypotonic stress (Cl--free 170 mosm/kg H2O). Then, tracer 22Na+ uptake was assessed in oocytes exposed to isotonicity using our usual isotonic uptake solution or NaCl containing hypotonic uptake medium (see Supplemental Material for details). Intracellular chloride concentration was assessed using ion selective microelectrodes. All measurements were performed in a Faraday cage to avoid electromagnetic interference. Each ion selective microelectrode was calibrated with 10−5 to 10−1 M KCl standard solution showing a nernstian behavior. Flag-tagged NCC protein, human Flag-tagged WNK4, Myc-tagged WNK3, and Myc-tagged L-WNK1 protein extracts were analyzed by Western blot. The following commercial HRP-conjugated antibodies were used: anti-Flag 1:5000 (Sigma-Aldrich), anti-Myc 1:1000 (Sigma-Aldrich), and anti-beta-actin 1:2500 (Santa Cruz Biotechnology). The following sheep antibodies were used at a concentration of 1–2 μg/ml: anti-NCC (recognizing residues 906–925 of human NCC, CHTKRFEDMIAPFRLNDGFKD); anti-phosphorylated NCC at threonine 45, threonine 50, and threonine 55 (T44, 48, and 53 in rats); anti-WNK4 (recognizing residues 1221–1243 of human WNK4, SSTGSQEQRASKGVTFAGDVGRM); and anti-phosphorylated L-WNK1 at S382. The blots done with the sheep antibodies were incubated for 1.5 hour at room temperature with secondary anti-sheep HRP-conjugated antibody 1:5000 (Santa Cruz Biotechnology) in blocking solution. The signal was detected by chemiluminescence using the Luminata Forte Western HRP substrate (EMD Millipore). The significance of the difference between the two groups was tested with t test and for three or more groups by one-way ANOVA with multiple comparisons with Bonferroni correction, using GraphPad Prism version 6.00 for Mac (GraphPad Software, San Diego, CA). We thank Dario Alessi, Dundee University, for the gift of the sheep antibodies. This work was supported by grant 165815 from the Mexican Council of Science and Technology (CONACyT) and IN200513 from PAPIIT-DGAPA to G.G., and collaborative international grants 188712 from CONACyT and ANR-12-ISVS1-0001-01 from the Agence Nationale pour la Recherche (ANR, France) to G.G. and J.H. S.B.-V. was supported by a scholarship from CONACyT-Mexico and is a graduate student in the Biochemical Science program of the Universidad Nacional Autónoma de México. This article contains supplemental material online at http://jasn.asnjournals.org/lookup/suppl/doi:10.1681/ASN.2014050470/-/DCSupplemental.